This 2016 re-boot of the 80's stone cold classic has received more than it's fair share of negativity (that is made fun of in the film itself). It has been attacked on two angles; that of perceived misogynists who hate the fact the all male cast have been replaced with women. Then there are those that think this film is an insult to the memory of the original films, especially since the original cast tried for many, many years to get a sequel made and in the end were only able to get an ok video game created instead (reviewed here). 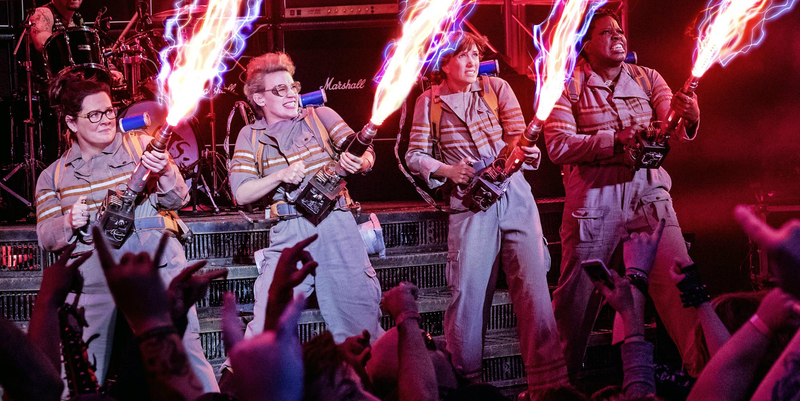 Before seeing this I was kinda on the later side, but now I have witnessed Ghostbusters 2016 has my view been swayed? I have fond memories of the original films, they hold special places in my heart, I even still remember the day as a child when I travelled to Milton Keynes with friends to see Ghostbusters II. As such a lot of my more memorable moments from this movie come when that is specifically referenced. 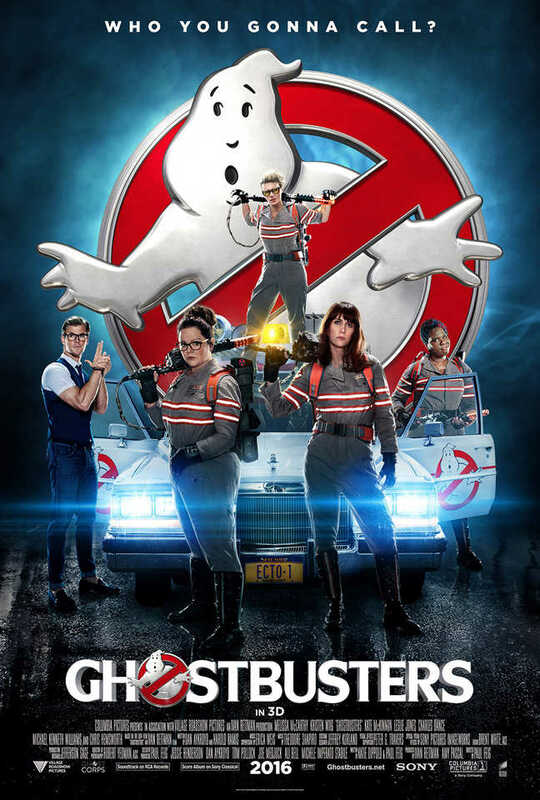 It all started off pretty decent with the classic Ghostbusters theme playing for a good nostalgic tinge, but then the theme tune never returns, instead we get a vastly inferior updated version. The same can be said for a lot of what happens here. The classic hearse is back but with a lame sounding siren, the ghosts are back but all CGI now (good looking CGI but not a patch on the original ghost effects), a lot of the key members of the original cast return in bit parts that aside from being fun are uninspired (Bill Murray, Dan Aykroyd, even Sigourney Weaver to name a few). What I did like was an origin story for how the iconic Ghostbusters symbol came to be, that was cleverly done and fed into a cool finale that both echoed Stay Puft Marshmellow Man's rampage as well as a nod to the cartoon. Talking of Stay Puft both him and Slimer make appearances as further nods back. Onto the new then, first a lot more weapons are swiftly introduced, you now have ghost grenades, ghost fighting power gloves, a ghost wood chipper device and even a ghost shotgun, a bit of over kill I felt, but there were a couple of cool moments with these. The ghosts themselves are designed in a fun way, and even manage to be creepy on the very odd occasion (such as one possessing a mannequin). The plot is very similar to that of the original film, albeit much more simplified. You get a similar way the four meet (Patty taking the place of Winston joining later on), an early ghost hunt that leads to accidental destruction, the finale featuring a huge ghost, altercations with the Mayor, and the cities eventual love for the group. My main issue comes with the actors, in particular McKinnon's character. Now the main antagonist is fine enough, he is quite low key and grounded but he doesn't irritate. Then you have Chris Hemsworth playing the part of a super dumb receptionist. He both delighted and irritated, starting off his weirdness was really quite amusing, leading to the most entertaining dialogue in the film (about a dog called Mike Hat, was cleverly hilarious, you had to be there), but by the films end his stupidity was really grating, though still occasionally funny. Of the Ghostbusters all four do have laugh out loud moments, each and every one does, yet they have far more misses in terms of humour. McCarthy has too many jokes based around bodily functions, Jones is forever in danger of falling into the loud mouthed, no nonsense black woman stereotype, while the worst of all is McKinnon. Her character was the walking embodiment of cringe, every time I saw her appear on screen, or talk I just felt so much cringe, I felt embarrassed for the actress having to act the way she did. The film goes out of it's way to make Jillian 'Krazy', from her constant random singing and dancing, her over the top facial expressions and gurnings, even down to the way she looks. She wears huge goggles for a lot of the film, wears over sized wellies, has her hair styled in a 'mad' fashion. McKinnon simply reeks of trying far too hard to be a mad character type and fails, instead coming across as a visual representation of humiliation that made me feel sorry for the actress. The best I can say of this movie is that it isn't terrible, it certainly is very funny in places, it has some decent special effects, lots of fun and not so fun nods to the originals, and the basic plot actually helps maintain the fast pace needed. It also has what I can only describe as a cracking and fun feeling finale that saved what had become kind of boring, A good example of an empowering film for women, there is not a single positive male role to be found here, they exist either to be made a mockery of (such as Hemsworth), or are nasty people (such as the Mayor and the FBI agents). For me the anguish of the jokes that missed completely neutralised this flick into what can only be called average; something I would not recommend people see, but one that I also would not discourage people seeing. Maybe it is like Marmite anyway, my sister who I saw this with absolutely loved it, and perhaps I am still a little biased.